He grabs his acoustic guitar, then stops. There’s a string of expletives. At his feet there’s a piece of paper, the chords and lyrics of this mystery song, and he just can’t manage to make them out. It’s the encore of the Dublin leg of Roger Waters’ Us + Them, and so far it’s been a slick, polished piece of rock theatre. Little audience banter, it’s a breath-taking roll call of Pink Floyd’s greatest hits, the set list seemingly identical to the performances across the world – North America in 2017, Australia and Europe this year alone. 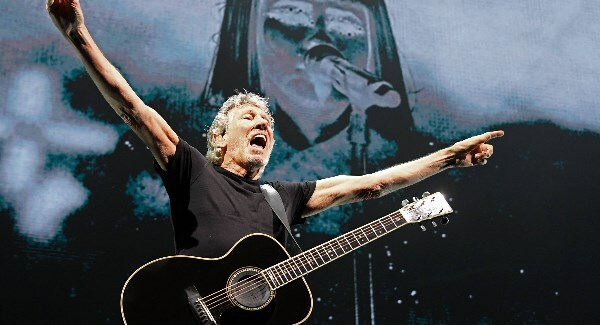 And now Roger Waters is about to play a piece from a scrap of paper strewn at his feet. The audience strains to make out the song, trying to make out the familiar chords of a Pink Floyd hit. There’s a murmur in the crowd, and then a cheer as the realisation dawns. Roger Waters is playing Danny Boy, his female backing vocalists ensuring it’s a haunting, powerful rendition. The duo, from indie band Lucius, in their matching platinum bobbed wigs, already, somehow, managed to outdo the studio version of The Great Gig In The Sky. Danny Boy was theirs for the taking. It’s a dramatic departure from the first half of the show. Then, they stuck to the script – Breathe is the opener, the full screen behind the band transforming the 3Arena into a cinematic experience, psychedelic animations and visual effects, pulsing red flashlights, smoke machines, searchlights, surround sound choppers overhead. Another Brick In The Wall wraps up the first half, with Dublin teens emerging on the stage, RESIST emblazoned on their T-shirts. They chant the anthem, the audience – fists raised in the air – can’t get enough. We are all thinking the same thing – it just can’t get much better than this. A 20 minute interval, and the second half begins, Waters firmer now in his political stance. ‘Trump Is A Pig’ flashes on the screen as they perform Pigs (Three Different Ones), revolting graphics and caricatures of Trump with the body of a pig marauding across the stage. Money becomes another attack on the US president. The mood shifts, for a haunting Us And Them, later again the crowd leaps to its feet for Eclipse, the prism of light creating an unexpected intimacy in the mammoth 3Arena. The venue seems to shrink all the more as Waters grabs his acoustic guitar for his next song and encore, Danny Boy. There’s time for one more song, and as the guitar solo builds in Comfortably Numb, Waters jumps from the stage for an impromptu walk among the front rows of the audience. Suddenly the 3Arena felt very small indeed. And, he was right. We were full of love.